Bell’s palsy – Why can’t I close my eyes? Bell’s palsy is a form of facial paralysis which can lead to the loss of the ability to close your eyes. The Upper eyelid has muscles which open the eyes (levator muscle and Muller’s muscle) and a muscle which closes the eyes (orbicularis oculi muscle). When the elevator muscles become weak or mal-functions what results is a droopy lid referred to as ptosis. The orbicularis muscle is supplied by the 7th Cranial nerve also called the facial nerve. In Bell’s palsy and other forms of facial paralysis this nerve is damaged and leads to weakness of eyelid closure. As the closing of the lids is reduced, the patient experiences dry eyes, red eyes, eye irritation, possible infections and potentially loss of vision. For this reason it is critical to see an eyelid specialist who performs eyelid reconstructive surgery – or an oculoplastic surgeon. The eyes are one of our most important organs as they control vision our most important sensory function. In addition the appearance of the eyes and eyelids is vital to how we present ourselves to society and for our self-esteem. We must do all we can to attain the best visual function and appearance after suffering from Bell’s palsy or other forms of facial paralysis. 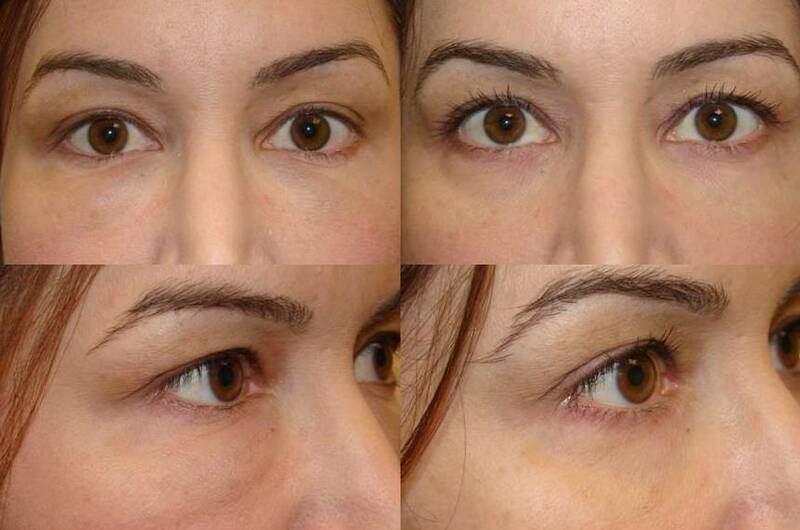 Fillers have become a very popular and standard treatment for lower eyelid dark circles and hollows. The two most common filler used for this purpose are Restylane and Juvederm. On occasion after the filler is placed a bluish color to the area can occur. This is called the Tyndall effect – and is named after the 19th century physicist John Tyndall. The Tyndall effect is caused by light reflection from particles in a clear material (suspension). These fillers (Restylane and Juvederm) are clear materials with many particles within them. When light is scattered from these particles the bluish color (Tyndall effect) can result. While a Tyndall reaction can occur in the best of hands it is minimized by appropriate placement of the filler around the eyes. This means deeper placement in small amounts. Before treating this problem it is best to wait a few weeks to assure that the color change is not due to late effects of bruising. The blue color can be removed with injection of hyaluronidase (Vitrase) which dissolves the filler – removing it in part or total – depending on patient needs. This is what is nice about fillers for the lower lids. They accomplish their task – filling hollows – yet are reversible so that problems are easily overcome. This is in stark contrast TO SURGERY which often times can lead to permanent issues. While fillers are routinely injected to the lower lids by many cosmetic doctors it is best to have this done by an eyelid specialist. Lower eyelid fillers are now a common treatment for dark circles, lower lid hollows and “Bags.” The most common fillers used for these purposes are from a family of gels called Hyaluronic Acid gels. In the lower lids Juvederm and Restylane are two fillers from this material that have been used the most. Placement of these fillers is generally safe with few complications. The most common issues are too much put in, too little put in, a bluish hue to the area of the fillers (called a Tyndall effect), and a swelling reaction (hydrophilic reaction). These issues can be managed by adding more filler when there is too little, and dissolving the filler for the remaining problems. The material we use to dissolve the filler is called Hyaluronidase. This is an enzyme with degrades (melts) the filler away. It is given by injection and within a short time the results are evident. The two most common brands of Hyaluronidase available are Vitrase and Hylenex. They both work and there are ongoing studies as to which may be better. I only use Restylane in the lower lids as I feel its properties make it less prone to these issues as compared to Juvederm. While still possible, I have not seen these issues with Restylane. Below (left) is an example of a woman who had a swelling reaction to Juvederm filler which is still present over a year after injection. On the right is her appearance within a day of Vitrase treatment to dissolve the Juvederm. As you can see it is much improved. What remains on the right lower lid (seen in the frontal view) is the natural fat (prominence) of her lower lid which can be removed surgically should she desire.